The preparations for the celebrations of wedding anniversaries involve as much detail as the weddings themselves. Hence the doubt, for which text is more appropriate to invite those who attend the party, can arise. What kind of paper should you print the anniversary invitations on? What kind of texts do you prefer for your invitations? José Antonio and Dolores Eugenia from JADE details tell you how to do it with ideas of anniversary texts. In this article you can find both phrases for childrens invitations to the wedding anniversary of their parents, as well as greeting texts from one spouse to another. First goes the children’s names and then the text. Change the number 25, that has been put as an example, by the number of years of the actual anniversary and replace "(Mother)" and "(Father)" with the names of your mother and father. We are honored to invite you to the 25th wedding anniversary of our parents (Mother) and (Father) who renewed their vows this (day and month) in the church (name of church). We invite you to be witnesses of the love that (Mother) and (Father) have had in 25 years of marriage. We hope to see you at (direction). We want to celebrate with you the 25th wedding anniversary of our parents (Mother) and (Father) this (day and month) at (direction). We are fruits of love and affection of our parents (Mother) and (Father) who have shared their life for 25 years and for that reason we want invite you to celebrate this great occasion next (day and month) at the (name of church). Life has allowed our parents to stay together for 25 years and that is why we want to celebrate with you the wedding anniversary of (Mother) and (Father) this (day and month) at (direction). This (day and month), mom and dad celebrate 25 years of marriage and we want invite you to witness their wedding anniversary at (direction). Once the text you will print on your invitations has been selected, then choose the most appropriate paper, according to the anniversary celebrated. For example, there are silver and gold papers, which can go wonders if you celebrate your silver or gold wedding anniversary. Paper simulating textures like wood, can be ideal to invite your wedding anniversary party of that material. In any case, you can always resort to more traditional papers for these invitations, like rice paper or lean for more fun options, printing them in painted papers. In this video you can find several templates for paper invitations that will surely be very useful. See also: What paper should you choose for wedding invitations? 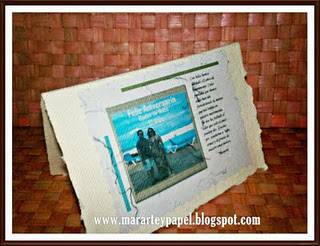 In this case not only will you find a text for a greeting card for your spouse, but also a step by step Do-It-Yourself with handmade paper. 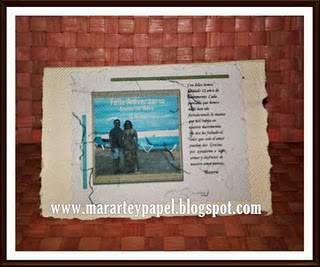 Traditionally, when you reach 12 years of marriage you are celebrating the Silk Wedding, so the handmade paper with threads would give the exact meaning to this special occasion, and the ease with which you can print the image and message. But in reality, this craft can be done to enforce any year of marriage. 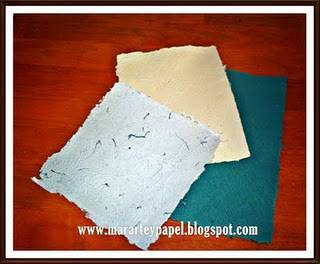 The first step is to do the combination of handmade papers that you're going to use and determine the order in which you place them. If you want, you can leave some of that natural border line when the paper is made which distinguishes it as a craft. 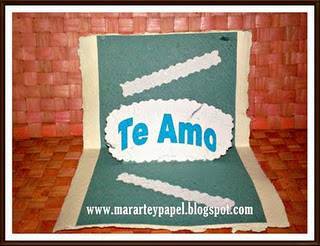 In this example, the main character of the three colors and textures, is the light blue paper with blue thread which is first in the image. It will be complemented by a pale yellow and one green paper. You can make them yourself. Fold the yellow paper in two (or whichever you choose to use in its place) and print on blue paper with threads the image and the special anniversary message (remember to change the "12" by the actual number of years of marriage). Paste on the front. You can use the suggested text or opt for the one you like. that only love can give. Glue the green paper (or its replacement) on the inside, once you've made the necessary cuts in the same three-dimensional effect that will make internal message. 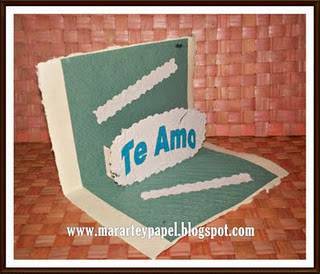 You can print the internal text on blue handmade paper with threads (or the one you're using instead), then cut it in the form of a cloud and paste on the green paper. Complement it with two strips or stripes of the same blue paper cut with craft scissors. On what paper will you print it? Write your comment in "Texts for wedding anniversary invitation"